1906The College was founded by Hon'ble Sri V Krishnaswami Iyer on 1st Feb., started functioning in a rented building belonging to Sri Bhasyam Iyengar in Pelatope, Mylapore. The period of study in the college was five years. At the end of the fifth year, the college gave a certificate called " VISARADA " in Veda, Smrithi, Mimamsa, Vedanta etc. Special provision was made for the study of English and modern methods of criticism. 1907Recognized by the Government of Madras. 1912The College was affiliated to the University of Madras and was placed in the list of aided Institutions with the grant of Rs. 1000/-. 1917Professors to teach English language were appointed separately. 1925Started the Sahitya Siromani Course affiliated to the University of Madras. The College also started preparing students for the Certificate of Proficiency in Oriental Learning, Hindu Law and Philology. 1961Started Veda Bhashya Courses in Rig and Krishna Yajurveda. Subsequently added Sama Veda Bhashya and Sukla Yajur Veda Bhashya with the financial aid of the Ministry of Education & S.W. Government of India. These courses were continued till 1972. 1966Started Jyothisha Siromani Course with affiliation to the University of Madras and financial aid from the Government of India. 1973Started Vyakarana Siromani Course with affiliation to the University of Madras and financial aid from the Government of India. 1977Recognized by the Government of India. 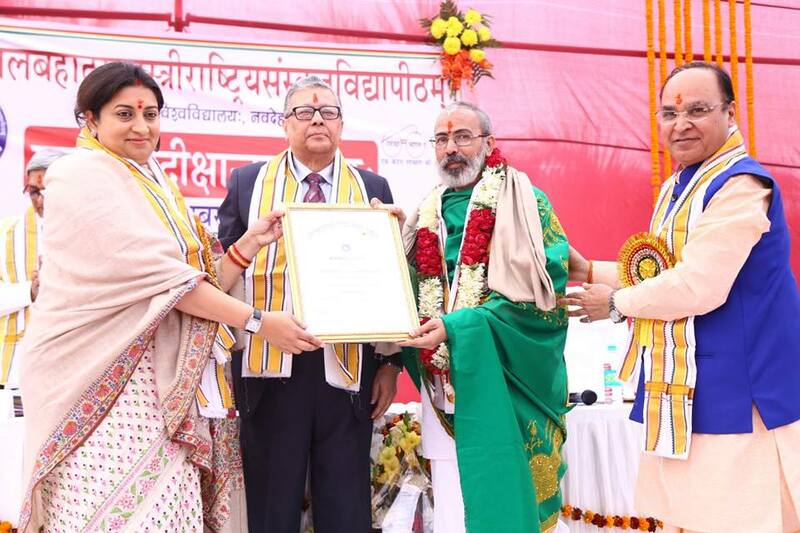 Ministry of Education & Culture under the Scheme of Adarsha Sanskrit Pathasala with concurrence of the State Government and began receiving grant from the Government of India. 1979University of Madras revised the pattern of the Siromani course with increase in the duration of the course from four years to five years. Under the new pattern, two more language papers viz, English and Tamil or Hindi were also prescribed in addition to the Sastraic subjects already prescribed in the syllabus. The language portions cover the text books prescribed for the S.S.L.C., plus two and B.A., at three stages at the end of I year, III year and V year respectively. 1989-90Admission was thrown open to women students. 1999 Nyaya Siromani course was started with the approval of the Univ. of Madras. 2004-05From this academic year, the University of Madras has revised the syllabus of Sanskrit Siromani Course with seven years duration under 10+2+3+2 pattern under CBCS with Semester scheme. Prak-Siromani course – 2years, Sanskrit Siromani Madhyama (B.A. )-3 years and Sanskrit Siromani (M.A) -2 years. The University of Madras has included English, Hindi/Tamil and Computer Science in the curriculum as compulsory subjects for this 7 years' course to meet present day needs and develop communication skills.